Paintings from the Cave: Three Novellas by Gary Paulsen. Review: Everyone always has something, some object, thought, or task, they do or think of to get away from unfortunate things in their lives. Whether it's loving animals, reading a book, or hiding somewhere; there is always something; that being said, what do you do to escape reality? I have read many Gary Paulsen books; therefore I know he's an unbelievably talented author. To me, Paintings from the Cave by Gary Paulsen is quite possibly one of his best novels yet. Like many of his books, the main characters include kids, teenagers, and or animals. One aspect of this book is that it was divided into three stories. Each 40-64 page story includes three different characters: in the first story the main character is a boy named Jake, the second story is a girl named Jo, and in the third story's main character was a boy named Jamie. Each story is incredibly different however, all of the stories have one thing in common; they are all about kids facing difficulties within their families and aren't exactly living the life they would want to live. For instance, in the first book, Jake, who has always believed that if "you stop moving, you're done", lives with an aunt that is an alcoholic and doesn't pay any attention to him. Jake adapts this motto because of the fear he feels toward a character named Blade. Blade is a criminal, a drug dealer who scares the living daylights out of Jake, so Jake does everything in his power to avoid him. Blade is never arrested [not that the police wouldn't bother to show up to those run down apartments], and is always on the lookout for more henchmen to do his dirty work. Jake has learned to keep a low profile, but that isn't enough. The infamous criminal Blade wants him now. But the real question is, can he escape from Blade, or will he end up working for the criminal, like most of the other young kids in the apartment complex for the rest of his life? Read the Paintings from the Cave to find out. Secondly, the next story is about a girl named Jo who like Jake isn't living how she would like to live. Joe lives in a trailer with her mom and dad who are horrific parents and alcoholics. They are constantly screaming at each other and fighting. Luckily, she too learns how to fly below the radar and passes by unnoticed. Joe's way to forget about her life is to surround herself with dogs of any kind. Like any other dog owner, Joe takes her dogs for daily walks. Unlike many dog owners however, she takes her dogs to the woods where she met another girl that love dogs just as much as she does, her name is Rose. Jo and Rose quickly became best friends but sadly isn't long before Joe discovers that Rose has been diagnosed with leukemia. The more time the girls spend together the more affectionate Joe's dogs become towards Rose. Rose is embarrassed by her illness and tries to isolate herself. Can their friendship be saved? Will Rose survive through her experience? Read the Paintings from the Cave to find out. Lastly, the third and final story included in this book is about a girl named Jamie. Like the second story, this girl has a special love for dogs. Unfortunately Jamie and her older brother are being physically abused .so they decide to move out of that house. Her brother Erik is very serious and understands that in order to support his sister and himself he needs to work two jobs. Erik relentlessly works around the clock to provide and is very strict about money. In contrast, Jamie is loving and more of a free spirit. She finds herself drawn to a local dog park; where she spends the day sketching dogs. She is noticed by a volunteer from the pet shelter and is offered a deal. His offer is to give her ten dollars per portrait, he believes that her drawings will aid in finding dogs new homes. Things seem to be looking up for the siblings, or so it seems. Are Jamie and Erik really capable of balancing their new life? Can Eric keep working two jobs or will he start to crack? Will Jaime take the generous offer and sell her sketches? If you truly want to dig down deeper read Paintings from the Cave and find out what mysteries lay behind the cover of this book. In closing, and as I mentioned earlier, I think Paintings from the Cave includes many elements essential for a great novel and is a ideal example of what young readers books should be like. One thing I was pleased about was the flow of the book, It is imperative that every book has a good flow and isn't choppy as many books are. Books that go too far off track always make me lose interest. Gary Paulsen has made himself of the best authors of all time. Paulsen has written brilliant book after book including Hatchet, Dog song, and The Rifle. Therefore, I agree with Publishers Weekly when they say "Paulsen writes another touching story about human kindness and humanity…… This emotional coming of - age journey about taking responsibility for one's own happiness and making personal connections will not disappoint". The reason I agree so greatly with Publisher Weekly on this particular quote is because Paulsen's books truly are touching are I can always count on his books to excite, inspire and certainly not disappoint me. Gary Paulsen has created a legacy and it is in fact an honor to be reviewing one of his books. To conclude, I am very eager to dive into another one of Gary Paulsen's epic works of art. Review written by Kaleb (6th grade student). We would like to thank Random House for providing a copy of Paintings from the Cave: Three Novellas for this review. 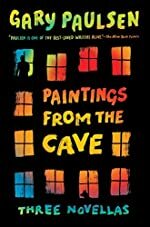 Have you read Paintings from the Cave: Three Novellas? How would you rate it? I love your review, it's really really awesome. Thanks to you, I'm going to the library soon to check out Hatchet and others that Gary Paulson wrote. :D Keep reading!